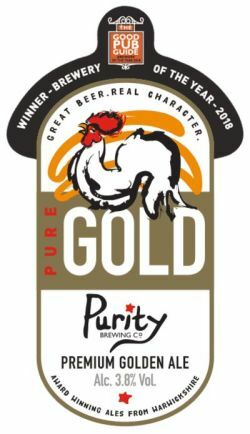 Pure Gold is refreshing golden ale with a dry and bitter finish. Brewed with English Maris Otter, Caragold and Wheat malts. Then generously hopped with Pilgrim, Citra, Bobeck and Hereford Goldings hops with an IBU 42. 3.8% ABV or 4.3% ABV in bottles. UPDATED: FEB 24, 2019 Bottle - clear golden amber, small carbonation but good soapy white head. Very pleasant slightly citrus aroma. Ok mouthfeel. Mild citrus tasting - overall very refreshing beer. Third, cask at Purecraft Bar and Kitchen. Clear pale golden body, clingy lacing, dissipating white head. Peachy aroma. Fruity flavours of lemon and peaches. Dry bitter ending, short-lived. Session qualities. (Birmingham 06.07.2018). On cask at PureCraft, pours a hazy golden with a large white head. Nose brings out subtle English hops and soft bready malt base. Flavour is gentle and smooth, with bready malt and subtle English floral hopping. Clean and easy, but nothing special. Cask at the standing order. Pours clear golden, nose is floral, lemon, grass, taste is sweet, floral, toffee. Very pleasant aroma lot of fruits, citrus, mandarine. A bit nice fruity sourness in armoma. Medium body. Nice malty taste with gentle bitternes that lasts very short. Good session beer. Very drinkable. 4.3% - Blond with light haze and lasting thin head. Aroma and flavour have some light citrusy hop notes. Very soft and smooth texture. Pleasant bitter aftertaste.